I wrote a brief post about this subject about a month ago, Butterflies & Symbolism, but since the butterfly is such a powerful symbol in dreams, and indeed, in life, and since I am doing these weekly posts on dream symbols, today’s symbol is the butterfly. I’ve rooted out some information from other sources, although in some instances I no longer have the url. a. Spiritual Evolution: The butterfly exists in four distinct forms. Some consider that so do we: The fertilized egg is planted in our mother's womb. From our day of birth we are like the caterpillar which can only eat and creep along. At death we are like the dormant pupa in its chrysalis. After that, our consciousness emerges from the cast off body, and some see in this the emergence of the butterfly. 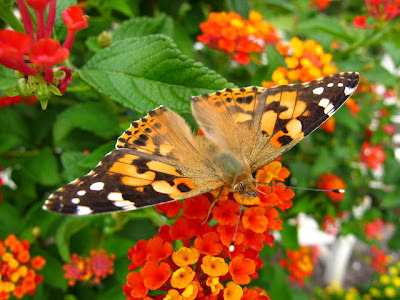 Therefore, the butterfly is symbolic of rebirth after death. b. For Christians, the butterfly's three steps of metamorphosis -- as caterpillar, pupa and then winged insect -- are reminiscent of spiritual transformation. The caterpillar's incessant crawling and chewing reminds us of normal earthly life where people are often wholly preoccupied with physical needs. The chrysalis (cocoon) resembles a tomb and empty, can suggest the empty shroud left behind by Jesus. Therefore, a butterfly represents the resurrection into a new condition of life that is free of any material concerns. In images of the Garden of Eden, Adam's soul is symbolized by a butterfly, or drawn with butterfly wings. In paintings of Mary and her Child, the presence of butterflies stands for their care for human souls. The Gnostics depicted the Angel of Death by showing a winged foot stepping on a butterfly. Since the insect is so fragile it can be torn apart by a hard rain, the butterfly stands for human frailty, both moral and physical. Also, as its life is not a long one, it is also a symbol of the ephemeral nature of physical existence. A butterfly with a torn wing is the icon for a North American charity that benefits disabled children. d. The ancient Greeks depicted the spirit of a person as a winged stick figure. Interpretation of that symbol gave rise to the idea of the "soul" or psy.cheh as a butterfly. e. Later, long-suffering Psyche, bride of Cupid (Eros,) was compared to a butterfly. It was her use of firelight to get a glimpse of the true nature of her mysterious sleeping husband that led to her downfall, and a series of dire trials that eventually led to her transfiguration. As I've said in the past, visit the Recommended Books on my website, and check out the Dreams & Dream Interpretation Section, as well as the Symbolism Section. One book in particular is to be recommended: The Penguin Dictionary of Symbols by Jean Chevalier. It's not your typical dream symbol cookbook type of book, rather, it is a cultural symbol book, which delivers a lot of value for its cost, and many entries are as extensive as we have cultures. Frequently by reading through a section that pertains to your dream, you will find the famous aha reaction that shows you that you have found somethihg connected to the true meaning of your dream.